The Canadian Gold Maple Leaf Coin is the official gold bullion coin of Canada, which was the second internationally recognized gold bullion coin, after the South African Gold Krugerrand. The Royal Canadian Mint pioneered to mint a gold coin in such high purity without adding any other strengthening alloy. The Gold Maple Leaf Coin has become one of the most popular bullion investments in the world. Face Value : C$50, C$25, C$10, C$5, C$1. Size Specification : 1 oz, 1/2 oz, 1/4 oz, 1/10 oz, 1/20 oz. Diameter : 30mm, 25mm, 20mm, 16mm, 14.1mm. The Canadian Gold Maple Leaf coin was introduced in 1979 minted by the Royal Canadian mint. 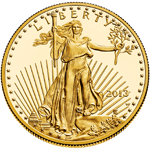 It was the first time to mint the gold bullion coin with purity 99.99%. 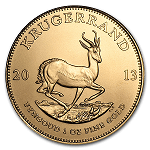 The high purity gold bullion coin was extremely popular with investors and collectors in worldwide. In May, 2007, a gold maple leaf coin with face value of $1 million was minted by the Royal Canadian Mint; its market value is worth over $2 million at the time. Its diameter is 50cm and thick is 3cm with mass of 100kgs and 99.999% fineness. In additional, for the gold is a soft metal, the gold maple leaf is with high purity, it may scratch or mar more easily than other gold coins with lesser purity. The obverse of the Canadian Gold Maple Leaf is a bust of Queen Elizabeth II designed by Arnold Machin. There are two versions of Queen Elizabeth II in the coin. Before 1990, the Queen on the coin is as a younger woman, and then changed as a more mature graceful portrait in 1990. 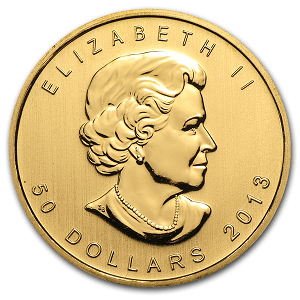 In both versions, "ELIZABETH II" is inscribed on top of the bust, "50 Dollars" and the year appears at bottom. The reverse of the Canadian Gold Maple Leaf is a maple leaf (from which the coin derives its name) which is the national symbol of Canada. "CANADA" is at top of the maple leaf; "FINE GOLD 1 OZ OR PUR" (the coin's purity in English and French) is at the bottom. "9999" is inscribed the left and the right of the maple leaf. In additional, there is a small maple leaf as an anti counterfeiting measure which is laser micro-inscribed with the last two digits of the coin's minted year. There are five sizes of Canadian Gold Maple Leaf coins: 1 oz, 1/2 oz, 1/4 oz, 1/10 oz and 1/20 oz, and their corresponding face value are C$50, C$25, C$10, C$5 and C$1. 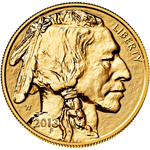 Those face values are legal; however, the face value of gold eagle is not equal to the market value. In fact, each Canadian Gold Maple Leaf coin's price is according to the gold spot price of current market plus a premium per coin. 1. The Canadian Gold Maple Leaf Coin owns graceful design, and the purity, weight and legal tender value of each gold coin is guaranteed by the Canada Government. 2. The Canadian Gold Maple Leaf Coins are with extremely high liquidity, you can easily buy and sell anywhere in the world where the precious metal are traded. 3. The Canadian Gold Maple Leaf Coins are small and exquisite, so that easy to store, or transport. 4. 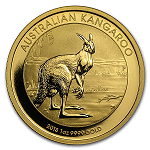 Unlike other gold bullion coins, the Canadian Gold Maple Leaf Coins are acceptable for your precious metal IRAs. 5. The Canadian Gold Maple Leaf Coins are minted in 24 karat gold without any strengthening alloy.